Today at 2:50 PM, several concerned citizens called 911 to report a reckless driver hit another car and then a fence on Santa Rosa Ave near Bennett Valley Road. 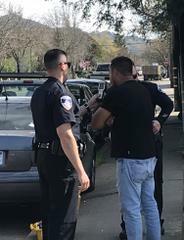 The citizen-witnesses estimated the speed of the bright orange Chevy Camaro reached as high as 100 MPH while traveling north on Santa Rosa Ave before the driver slammed on his brakes to avoid another car travelling at the legal speed limit in the right lane. As the driver hit the brakes, he swerved to avoid rear-ending the other car. He collided with the left quarter panel of the car then lost control and drove straight through a section of 7-foot temporary chain link fencing on the corner of Santa Rosa Ave and Bennett Valley Road. 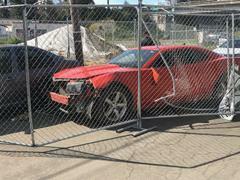 The car pushed the fence along the sidewalk before turning onto Rutledge Ave and colliding with a parked vehicle. The driver of the Camaro was identified at the scene as 30-year-old Santa Rosa resident, Ignacio Floriano-Munguia. He is currently on probation with a suspended license for a previous driving under the influence (DUI) incident. In the car hit by Floriano-Munguia were two young children and their father. Fortunately, dad had his 6-year-old son and 3-year-old daughter safely secured in their respective booster and 5-point harness car seats and they were uninjured during this collision. However, had the Camaro rear-ended their car at the near 100 MPH it was reported as travelling moments before the collision, this would have been a much different and very tragic ending for this family. Thank you to our community members who quickly called to report the reckless driving and collision, and everyone please remember to not drink and drive!